An atypical nevus or dysplastic nevus (mole) is a benign growth that may share some of the features of a melanoma, but is NOT a melanoma or any other form of cancer. The presence of an atypical nevus, however, may increase the risk of developing a melanoma, or be a marker for it. A single atypical nevus may indicate a small risk; this risk increases with the number of atypical nevi present. An atypical nevus can vary in appearance. Since it has the ABCDE features of a melanoma, it is important ot have a dermatologist examine all moles. Asymmetry - One half does not match the other half in size, shape, color, or thickness. Border irregularity - The edges are ragged, scalloped, or poorly defined. Color - The pigmentation is not uniform. Shades of tan, brown, and black are present. Dashes of red, white, and blue add to the mottled appearance. Diameter - While melanomas are usually greater than 6mm in diameter (the size of a pencil eraser) when diagnosed, they can be smaller. If you notice a mole different from others, or one which changes, itches, or bleeds (even if it is small), you sould see a dermatologist. A first-degree (e.g., parent, sibling or child) or second-degree (e.g., grandparent, grandchild, aunt, uncle) relative with malignant melanoma. People with Familial Atypical Nevus Syndrome should also examine their own skin every month. When performing self-examinations, be aware of any lesions that appear to change in size, color, and/or shape. If a change has occurred, bring this to the attention of a dermatologist immediately. 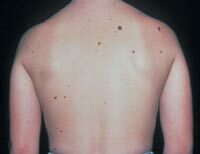 Information on the early signs of melanoma is available from the dermatologist or the American Academy of Dermatology. Apply a broad-spectrum sunscreen which protects against ultraviolet light (UVA and UVB) and has an SPF of 15 or higher daily.